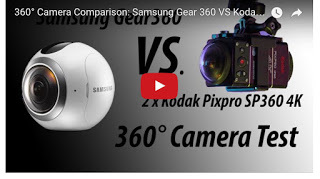 There are two consumer 360-degree cameras slugging it out for title of having the best 360 video quality: the Samsung Gear 360 (reviewed here) and the Kodak SP360 4k dual pro pack. Both have 4k video quality but they take different approaches. The Samsung Gear 360 is a fully spherical all-in-one camera. The Kodak SP360 4k is a hemispherical camera with a modular design that allows you to combine two of them back-to-back to capture fully spherical video. That may seem cumbersome (and more expensive), but it does allow the possibility of using it to capture aerial 360 videos without the drone in the shot (see here). What about the image quality? I had posted a sample video comparison, but the conditions were not completely identical. Now, 360Grad-film.de has posted a direct comparison between these two cameras here. What do you think? Danke schön to 360Grad-film.de for this awesome test!